Today marks the 3rd Martyrdom anniversary of Ayatollah Nimr Baqir al-Nimr, who was brutally executed by the autocratic Saudi regime. He was a prominent human rights activist who always vowed for right to dissent. It was because of this activisim, the monarchy in Saudi Arabia falsely implicated him in number of cases. Nimr faced a series of serious charges, including “disobeying the ruler” and “encouraging, leading and participating in demonstrations”, allegations that human rights groups including Amnesty claimed violated free speech protections. The group went on to describe Nimr’s arrest as part of a campaign by the Saudi authorities to quash all dissent. With politically motivated and grossly unfair trail, he was finally executed on 2 Jan 2016. Ayatollah Nimr was from Awamiya, a village in Saudi Arabia’s far east, near the Persian Gulf. The village is in a region that is predominantly Shiite and has long complained of religious discrimination. Born in 1959, Al-Nimr came from a Shiite family famous for its history of resistance. Nimr’s staunch and vocal support of the movement in regions where the Shia have a majority but have frequently complained of marginalization, saw the 56-year-old cited as the driving force behind the protests while affording him hero status among Saudi’s Shia youth. 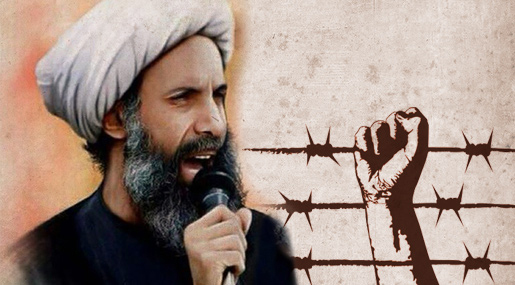 To the Saudi kingdom, however, Nimr had become a high-profile thorn in its side. He played an instrumental role in Saudi Arabia’s mass anti-government protests of 2011. The protests included public speeches by Nimr that urged an end to the Al Saud monarchy and pushed for equality for the state’s Shia community but his weapon was only roar of word as he never encouraged violence. On one occasion, he urged protesters to resist police bullets using only “the roar of the word”. Shiites in Saudi Arabia, accounting for 10% to 15% of the population, face “systematic discrimination in religion, education, justice and employment,” a 2009 Human Rights Watch report said. According to Human Rights Watch researcher Adam Coogle , “Saudi Shia are virtually excluded from serving in senior government posts, the security services, the Foreign Ministry and the justice system”. They also face severe restrictions in their religious practice, and Saudi school textbooks “continue to use coded language to refer to Shia as unbelievers/polytheists,” Coogle said. “The specific case of Sheikh Nimr al-Nimr raises serious concerns regarding freedom of expression and the respect of basic civil and political rights”. Popular Front for the Liberation of Palestine (PFLP) condemned the execution, saying that the Saudi government “insists on pouring oil to the flames of sectarian sedition”. Britain’s Shadow Foreign Secretary, Hilary Benn, described the execution as “profoundly wrong”, and condemned the act of execution in general. The then UN Secretary-General Ban Ki-moon voiced his dismay over the execution of Nimr. Statements revealed that the Secretary-General had raised the case of Sheikh al-Nimr with the leadership of the Kingdom of Saudi Arabia on a number of occasions. The United Nations High Commissioner for Human Rights Zeid Ra’ad al-Hussein decried the execution of al-Nimr as a “disturbing development”, since he had not committed a crime that belonged to the category of “most serious crimes” under international law, adding that the death penalty could only be handed down with stringent respect of due process and fair trial guarantees, and full transparency throughout the process. Human Rights Watch said the executions “further stain Saudi Arabia’s troubling human rights record”. Sarah Leah Whitson, the group’s Middle East director, said Nimr was convicted in an unfair trial and that his execution was “only adding to the existing sectarian discord and unrest”, adding that “Saudi Arabia’s path to stability in the Eastern Province lies in ending systematic discrimination against Shia citizens, not in executions”. Amnesty International called Sheikh Nimr’s trial political, grossly unfair, and stated that the execution was to settle political scores.